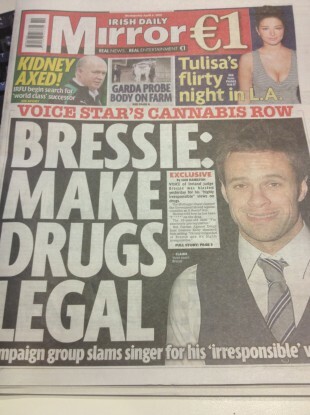 NIALL BRESLIN, COACH on The Voice of Ireland and former Blizzards lead singer has hit out at reports today that he wants to “make drugs legal”. A front page story in today’s Irish Daily Mirror features a response from Europe Against Drugs president Grainne Kelly which slams the Mullingar singer for comments he made during a Hot Press interview. … a journalist that I usually do not give interviews to, has taken excerpts from my interview with Hot Press magazine to promote my new album out of context. The original interview was with the highly regarded journalist Stuart Clarke, a man who I trust implicitly and know respects my honesty in interviews. Breslin said that while he would never advocate the legalisation of drugs like cocaine or meth, he and Clarke did discuss the legalisation of cannabis. In today’s blog post the singer said that in his opinion cannabis is no more harmful than alcohol when taken in moderation, and said that he believes that in this country alcohol is the more destructive of the two. He also said that he supports the taxation and decriminalisation of cannabis, citing the recent controversial introduction of the property tax and the possibility of cannabis taxation as an alternative. Breslin said that he does not now smoke cannabis or take drugs in any form, but that he discussed his previous use of cannabis in the past in the Hot Press interview and said that he’s “never been uncomfortable in the company of someone who’s high on marijuana”. Grainne Kenny from Europe Against Drugs told the Irish Daily Mirror that Breslin’s comments were “misguided” and “highly irresponsible”. The singer has said today that in an ideal world he would recommend that alcohol, nicotine, cannabis and all drugs are avoided, but that this is an “unrealistic and perhaps a slightly romantic request in today’s modern world”. He said that during the course of his Hot Press interview he also advocates living a healthy and balanced life in order to achieve a “positive mental attitude”. Hot Press’ Stuart Clarke has also responded, calling Grainne Kenny’s comments “typical bury your head in the sand rhetoric”. Email “ Bressie clarifies 'legalisation of cannabis' comments ”. Feedback on “ Bressie clarifies 'legalisation of cannabis' comments ”.